The dust has settled and only two teams remain in the 2012 Stanley Cup Playoffs. 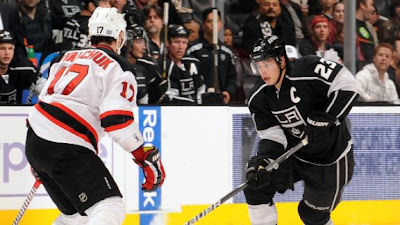 The Los Angeles Kings have emerged from the Western Conference and the New Jersey Devils have earned the right to represent the Eastern Conference in this year's finals. The two teams that earned the right to play for Lord Stanley's Cup were not the regular season's top two teams but clicked at the right time and did not look back once they started rolling. The Kings have reached the Cup Finals for just the second time in franchise history and the first time in since '93, and they did not go the predictable route when getting there. The Kings eliminated the West's top three seeds while going 12-2 overall and 8-0 on the road. Dustin Brown and Jonathan Quick have penciled their names in for Conn Smythe consideration due to their consistently dominant play. On top of his physical play, Brown has racked up seven goals and 16 points through 14 games, and Quick has a league best goals against average, 1.54, and save percentage, .946. On the flip-side, the Devils have reached the finals with the help of overtime heroics by rookie star, Adam Henrique, not once but twice. The Devils eliminated the East's number three seed and number one seed with overtime goals by Henrique in game seven of the first round and game six of the Eastern Conference Finals respectively. The Devils have received a valiant effort from star forward, Ilya Kovalchuk, who before this season had not advanced out of the first round of the playoffs. Kovalchuk leads in post season points with 18 and has netted seven goals in 17 games played. Of course when mentioning the Devils going to the finals, like any time they have had post season success in the last two decades, you have to talk about Martin Brodeur. Brodeur has anchored the Devils and has shown flashes of his young-self while trying to hoist the Cup for the fourth time of his career. Both teams are healthy and have no significant injuries. An interesting side note, Kings' Simon Gagne has been practicing of late and has traveled with the Kings to New Jersey. However, the probability of seeing Gagne in the line-up in the finals should be quite slim. The biggest match up of this series will be the one in net, the seasoned veteran versus the young future of the league, Brodeur versus Quick. Brodeur has experience on his side, he has won the Stanley Cup three times already and has been to the Finals four times previous to this one. Quick on the other hand, has been a little more dominant through the post season and may be able to out perform Brodeur when needed. The series maybe decided in the battle of special teams, the Kings have had perhaps the best penalty killing unit through these playoffs, killing and astounding 91.2% of their penalties and have scored five shorthanded goals. However, their power-play has been dreadful, scoring just 8.1% of the time. The Devils' penalty kill is working at a lowly 74.2% and may be the jump-start that the Kings' man advantage needs. If the Kings can get the power-play unit clicking than they may make easy work of the Devils. I have picked the Kings in six in every series up to this point, and the Kings have yet to even play a game six. So why change now.